Nexon has 10 new mobile game releases on its timetable for the first half of 2019, the company announced Tuesday. Korea’s biggest game company is making use of its original intellectual property and popular foreign titles for various genres, ranging from role-playing games to puzzles. Of 14 major events Nexon has in store for the first half of 2019, four are global launches of games already being serviced in Korea. Nexon will introduce “Durango” globally in the first half in countries other than China and Japan. For the Chinese market, Nexon will wait for the license approval process to resume, while for the Japanese market the company is undertaking the localization of the game. “Overhit” is scheduled to launch in some 150 countries within the first half, and “Maplestory M,” which is garnering popularity in Korea and Southeast Asia, is to launch in Japan in April. The company will introduce “Dark Avenger Cross” in Japan on Wednesday. Nexon has reformatted its hit online PC games to mobile versions for “Crazy Arcade BnB M,” to launch domestically and globally on March 21, and “The Kingdom of the Winds: Yeon,” to launch in the first half in Korea. “Nexon will continue to show its competitive edge cross-platform and cross-genre,” said Kim Hyun, vice president of Nexon. 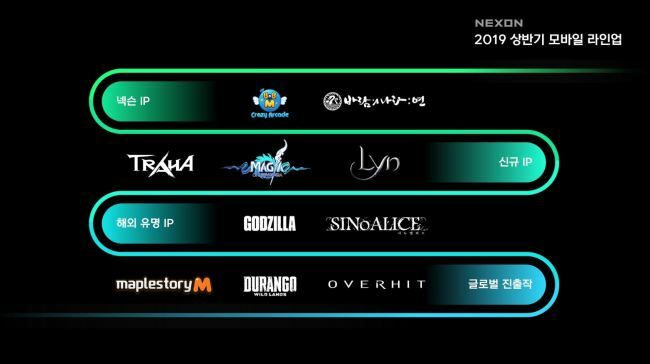 Other than reformatting original IPs for a new platform, Nexon has also crafted novel IPs for “Traha,” “Magia” and “Lyn,” which are slated for release in the near future, as well as “Spirit Wish,” “RunningMan Heroes” and “Runway Story,” which have already begun service this year. “Traha,” is a grand-scale mobile game that Nexon will release on April 18, which is best on the 5G network. The game raked in a record volume of preregistrations with over 2 million people in 10 days. “Lyn” will launch across the world on Thursday, while “Magia” will release at an unspecified date in the first half. As for “Godzilla” and “Sinoalice,” Nexon has bought the popular foreign IPs from Japanese firms Toho for the former and Pokelabo and Square Enix for the latter. A majority stake in Nexon’s holding company NXC is up for sale, with the auction slated for early April in a deal valued at 1 trillion won ($885 million). Deutsche Bank Securities and Morgan Stanley, the manager of the deal, have reportedly shortlisted Korean internet firm Kakao, Chinese tech giant Tencent Holdings, Seoul-based private equity firm MBK Partners and Boston-based Bain Capital, as well as an undisclosed bidder.